The year 2016 in retrospect - a year of volatility. Before I start talking numbers, I thought I would share some pictures from the end of 2016. There is no question that the 2016 year was a year marked by extreme ups and extreme downs in the stock markets. Although the economy was about the same for the entire year, the markets moved up and down to economic activity perceived by traders, but unseen by economists. 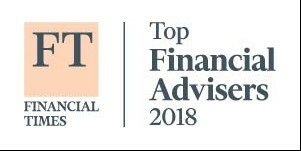 It was quite an interesting year from an investing perspective, and since there were so many events that moved the market, it was really hard to know whether you should have been invested or not. Shortly after all that was said, the markets recovered nicely in March and the first quarter ended almost even. Optimism, as compared to pessimism, ruled April and May and the markets moved higher before the fatal Brexit vote on June 23, 2016. After that vote, the market sold off sharply before rallying back at the end of June to end the second quarter with the S&P and the Dow Jones Industrial Average up around 4%, but the NASDAQ was still negative for the year. After the first six months of 2016, I was hopeful that would be all of the volatility we would see for the year 2016 - little did I know what bombshell would drop later in the year. 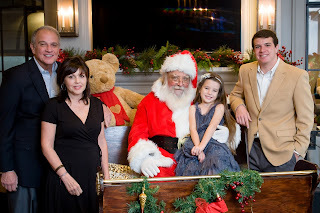 As I predicted from the first of the year, the economy would be stable and the financial markets were likely to return at least 6.8%, but it would not surprise me to see double digit returns for the 2016 year due to increasing employment in an economy that was strengthening,. The third quarter ended with a nice rally over the summer months. However, beginning in October we saw high volatility based upon the political pundits’ projection of an easy Hillary Clinton win in the Presidential election. The markets traded in wide swings based upon virtually every comment made by the politicians. Going into the election in early November, all of the gains for the year had evaporated and the markets were essentially flat preceding the Presidential Election. Many, myself included, predicted that the election of a politician with the same political and economic beliefs as the current administration would be uneventful. Boy, were we wrong! After the election, all hell broke loose. The markets swung wildly due to the opposing optimistic and pessimistic outlooks of the political parties. The financial sector then rallied dramatically with the thought that banking regulations would be repealed. And before we knew it, growth funds were out and value funds holding financial stocks came into favor, sending the growth sector into a downward spiral as the value sector shot up. Even more distressing was the absolute thrashing that the international markets endured. Obviously, the new president-elect would never purchase anything from China or Asia again (insert eye roll) so those markets sold off 15% after the election. Yes, 15%! I would say this is laughable, except it is not when you look at the big picture, and consider how many people it impacts. These markets are the cheapest markets in the world, yet traders do not trade based upon economics, they trade based upon daily changes in sentiment for the future. The president-elect’s open disdain for Latin America caused those markets to also suffer double digit losses. In fact, with the strengthening of the dollar, due to the increase in interest rates in December, the entire world sold off compared to the U.S. stock market. Despite these international markets being priced at a level for significant gains in the future, traders were not willing to listen to what was happening at that time, and chose to rely on what they perceived to happen in the future. I am approached by a lot of people who, even today, say the markets are overvalued. I would have to disagree with that opinion based not only on the perception that the government will finally start getting out of the way of the private sector and allow innovation and growth to occur without the intervention of needless regulation and government policy, but also on economic facts. For the last several years, the S&P 500 has been on a negative earnings trend. I guess it could be argued that a good deal of that trend relates to the price of oil. You may readily recall that the price of oil in 2014 was $100 per barrel. At the beginning of 2016, the price had fallen dramatically to $30 per barrel. At one point in the spring of 2016, the time of year when oil tends to rally before the prime summer driving season, the price of oil dropped to $25 per barrel. Before the end of 2016, oil had essentially doubled in value to $50 per barrel but the damage to the earnings of the oil stocks was dramatic and a little mind boggling to the average investor looking in from the outside. As I have often written in past blogs, the most important component to stock valuations is their earnings. For the year 2016, the earnings for the S&P 500 are projected to be $109 per share. If you would expect the market to continue to grow in 2017, you would have to assume that earnings would also be growing. I am sure there are many people who think that I make up these numbers, but the S&P earnings are well documented on the Standard & Poor’s U.S. based website. For some light reading, check it out for yourself: http://us.spindices.com. They report earnings that are constantly changing but are readily available based on current information. On the website, it reports earnings for 2016 are $109, but for 2017, they project earnings to be $131 (or a 20% increase over 2016 earnings). And in fact, they project for 2018 earnings at $147 (a 12% increase over the projected 2017 earnings). In essence, the 2016 earnings of $109 will grow based on this information to $147 over the next two years, or an increase of 35%. It is hard to fathom that the market could in fact go down based on these dramatic increased earnings over the next two years. These earnings are currently posted, but they do not reflect the reality that maybe the economy actually will get better in 2017. There are many economists now projecting that with the new administration, the U.S. economy will increase in GDP growth from the current 2% range to as high as 3.5%. If in fact a growth in GDP occurs, it is almost assured that the earnings report above will be higher. However, one of the most important considerations that the doomsday crowd is missing is the potential for a lower tax rate in the United States being approved. The president-elect has proposed that the current federal tax rate for corporations of 35% be reduced to 15%. While certainly there will be some offsets if that tax decrease occurs, reported earnings will go up significantly. I keep hearing the opposing masses say that the 35% rate is artificial and that no U.S. corporation actually pays that type of rate. While to a certain degree that is correct, their reported earnings all reflect a 35% rate because current accounting laws require that rate to be accrued based upon the maximum amount and maximum rate. It is estimated by some economists that this decrease in income taxes will dramatically improve earnings and that increase could be $14 per share, if not higher. Therefore, to make an estimation of the year-end 2017 S&P value, you just need to work with the numbers that are currently available. If you take the $131 per share projected by the S&P earnings and you increase it by $14, the projected decrease in tax rates, you can see what the projected S&P valuation might be. I will assume for the purposes of this calculation that the tax rate only improves earnings by $7 or 50% of the projected level. Based upon that analysis, you are currently estimating S&P earnings for 2017 at $138 per share. If you add a multiple of 17 as I have done through the years, then the S&P would be 2,346 at the end of 2017. The year began at 2,238, therefore an increase of 108 per share or a positive return of the S&P at 4.8%, plus the dividend rate of 2.1%, for a total increase for 2017 of 6.9%. If you will also assume that the economy picks up in 2017, then a higher multiple would be warranted. Therefore, an 18 multiple would yield a year-end valuation of 2,484, or an increase of 246 for a return of 11% for 2017 – and don’t forget the dividend yield of 2.1 for a return of 13.1%. Therefore, my fearless projection for the 2017 year would be somewhere between the 17 multiple and the 18 multiple. 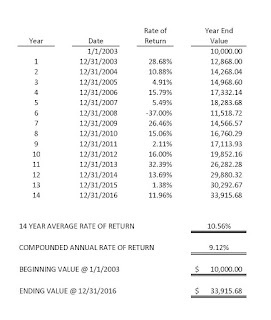 If you do the statistical average of those two ratios, you end up with a double digit projected return in 2017 of approximately 10%, which includes the dividend growth of 2.1%. Therefore, for 2017, I once again project a double digit return in financial assets for this upcoming year. If you will review my blog from January 3, 2017, you will note that the last 13 out of 14 years have been positive on the S&P 500 Index. If 2017 works out as projected herein, that would mean that an overwhelming 14 out of the 15 previous financial years have been positive years for the broad-based S&P Index of 500 Stocks. The S&P ended the year with a total gain of 12% for 2016, a five-year return of 14.7%, and a 10-year of 10.9%. The Dow Jones Industrial Average was up a sterling 16.5% in 2016, with a five-year return of 12.9%, and a 10-year return of 7.5%. The NASDAQ Composite, which reflects smaller capitalized stocks, was up 8.9% in 2016, 17.1% on a five-year return and 9.5% over 10 years. In comparison, the Barclays Aggregate Bond Index was up 2.5% for 2016, up 2.1% for the five-year period and up 4% for the 10-year period. As can be seen, the bond index has significantly underperformed any of the broad indices above. As I mentioned earlier, 2016 was an unusual year in that growth investments well underperformed value. There are many investors wondering why their 2016 return was significantly below the recorded index of 500 stocks. The simple answer to that is that most of that growth occurred after the election and in financial assets (banks). Under the assumption that the president-elect will significantly reduce banking regulations, financial stocks dramatically rallied and in some cases increased 30%-40% over their pre-election levels. This huge run-up in the financial sector dramatically altered the returns and were not representative of the growth of the economy. As I have always pointed out, we invest for growth over the long-term, not for short-term valuations. We think growth will outperform value over any relative time frame above five years, as I believe history has supported that position. However, since the election occurred near the end of the year, the growth in these value stocks was well in excess of the growth realized in the growth sectors. I am very optimistic going into 2017 that we will see growth overtake value. If the president-elect is successful in accomplishing even some of his stated goals of lower taxes, lower regulation and lower government involvement in private industry, there is a high likelihood growth will take off to a much higher level. If all of that occurs, corporate earnings will go up and the acceleration on the economy will lead the rest of the world’s stock markets higher, even if they are kicking and screaming along the way. Things look really good for 2017 in both the economy and corporate profitability so I would certainly anticipate corporate earnings to accelerate, pushing financial markets even higher. I guess now we will just have to wait and see if the vision of a better economy actually comes to realization or whether it is just an illusion…. 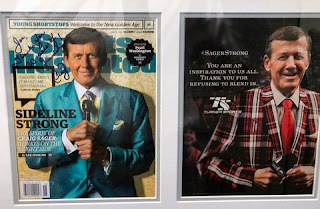 Many of my clients know that I had a long-standing relationship with Craig Sager, which was as colorful as Craig was when he dressed for his TV appearances. Craig recently passed away after a three-year fight with acute leukemia. Craig was one of those individuals who you thought would never die. In the 30 years I have known Craig, I cannot remember a time, prior to his leukemia diagnosis, when he was not in top physical condition. While attending college, Craig was the mascot on the Northwestern University campus in Chicago, Illinois. More importantly, according to Craig, he was also the President of the Delta Tau Delta Fraternity. This was the actual fraternity house that the movie Animal House was based upon, and he assured me that his recollection of the fraternity was just as rowdy and colorful as the movie. 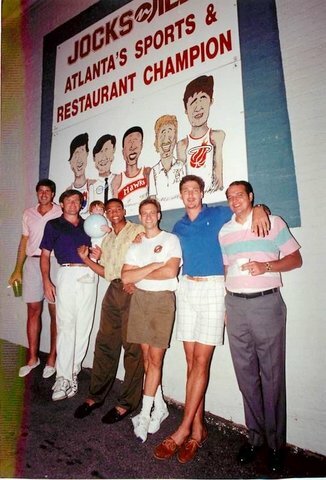 In 1987, I was approached by two of my NBA clients who were considering investing in a restaurant in Atlanta. I told both of them that the investment was not very smart, and it would just be a matter of time before they lost their money. Against my advice, they invested anyway deciding they would have fun while it lasted. 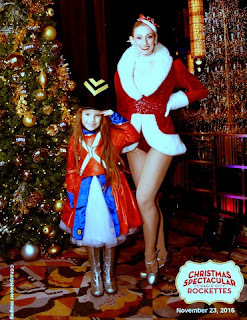 I was not involved at all in those early days, but was shortly after, much to my surprise. 1988 (or so) - I was added to the Jocks crew. Around this time, I had become friendly with Craig Sager, since he originated the concept. To Craig, every day was a good day, and the next would certainly be better. When I was asked to come in and see why their bar was not successful, I did not realize the owners were transporting alcohol from Cobb County into the city of Atlanta, which unbeknownst to them was illegal. I also found out that the owners, comprised of professional athletes, had not applied for health licenses, liquor licenses or anything else required to operate a restaurant. After rectifying those shortcomings, I then became part owner of this non-thriving business that was losing money and appeared to have no future. But the restaurant grew, and Jocks & Jills became the first sports bar in Atlanta and is still being copied by many new establishments opening up today. Our 10th Street location began with total sales of roughly $10,000 during an extremely good week. After 20 years, we owned the most successful sports bar in America and sales were $500,000 per week. 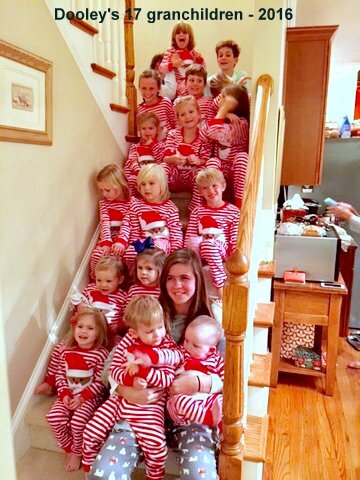 We started with a total of five employees and had 1,500 at the end. Much of this growth in the business was due to Craig’s notoriety and his never-ending promotion of the restaurants. I ran the operations, he handled the promotions. It was an exciting time. 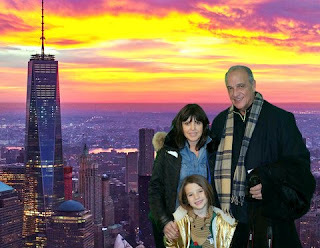 In retrospect, I could tell you many stories about Craig and the wild and crazy things we did over the last 30 years. 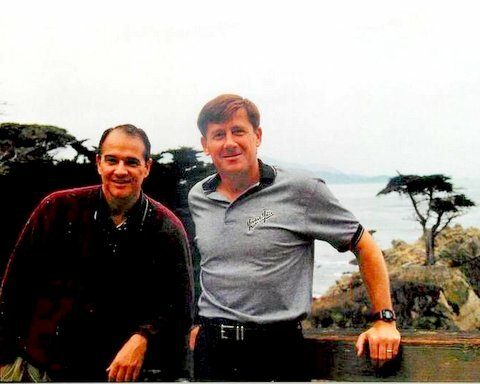 One of my favorite Sager stories was when he invited me to play golf at Pebble Beach. Typical Craig, everything happens in the spur of the moment. On Thursday, he informed me that we had a 9:00 am tee time on Saturday at the world-famous Pebble Beach Golf Course, and if I would like to play he would meet me there. Purchasing a last-minute plane ticket to San Francisco was outrageously expensive, but I flew there on Friday and drove down the coast line, virtually in the dark, to reach the Inn at Spanish Bay at roughly 7:00 pm. I checked with the front desk, but they had no knowledge of Craig Sager even being in the area. Given the rates of the hotel, I had become somewhat concerned that Craig had stood me up 3,000 miles away from home. The next morning, I checked with the front desk, and even with our tee time being less than two hours away, they had no record of him being on the premises. I was $3,000 into this trip and the tee time was not even in my name! About 30 minutes later, I ran across Craig who had apparently shown up in the middle of the night and hadn’t bothered to book a room – just sat in the bar waiting to play. He packed no clubs and no change of clothes despite planning on leaving later that afternoon to spend a long weekend in Vegas. Typical Craig, he lived for the moment and tomorrow would be worked out later. After playing at the beautiful course, we headed back up the coastline toward San Francisco to part ways – I was flying back to Atlanta, and Craig to Vegas. Somewhere along the way, Craig decided he would just fly out of San Jose because the flight was cheaper. After dropping him off at the San Jose airport, I glanced back in my rearview mirror and there he was showering off under a local water hose before getting on the airplane. I would like to say that I could not believe it, but I have hundreds of stories about Craig which are mostly along the same vein. There were times when Craig and I would have conversations multiple times a day, and they were ALL positive. That is just the kind of guy he was; and when I introduced him to who would later become his wife, she was immediately drawn to his positivity and spontaneity as well. They subsequently had two children and reside in the outskirts of Atlanta. 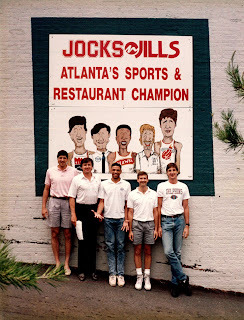 There is no question that Jocks & Jills was amazingly successful and we definitely had a lot of good times during its heyday. 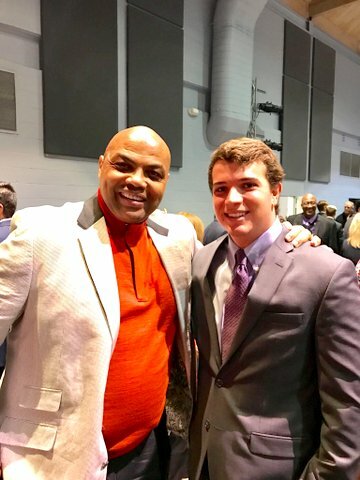 Even more amazing is that this reporter out of Illinois, who jumped the fence when Hank Aaron hit his home run in 1974 (when he was making $95 per week), could end up being idolized on national television due to his contagious personality, close relationship with NBA players and outlandish clothing. 1974 - Craig Sager on the field when Hank Aaron broke Babe Ruth's home run record. 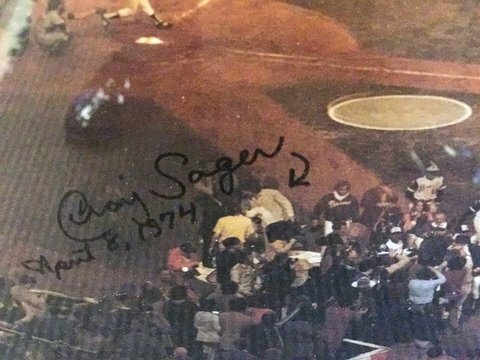 Craig’s funeral was a couple of weeks ago, and it was heartwarming to see the personalities and athletes that showed up for the service. 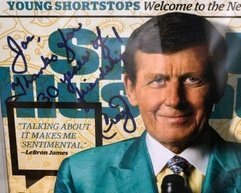 Even towards the end, I never really thought Craig Sager would pass away because his love for life seemed to overwhelm everyone around him. Although he is deceased, I wanted you to understand how far back we go and how deep our relationship was over the last 30 years. Around Craig, life was never boring – he will be missed. 13 out of 14 ain't bad - a 93% win ratio! 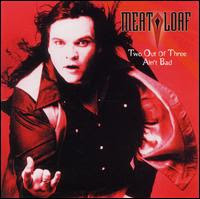 My apologies to Meatloaf for somewhat borrowing his song title from 1977, “Two Out of Three Ain’t Bad”. Once again, the Standard & Poor’s Index of 500 Stocks had a double digit positive return for the year. 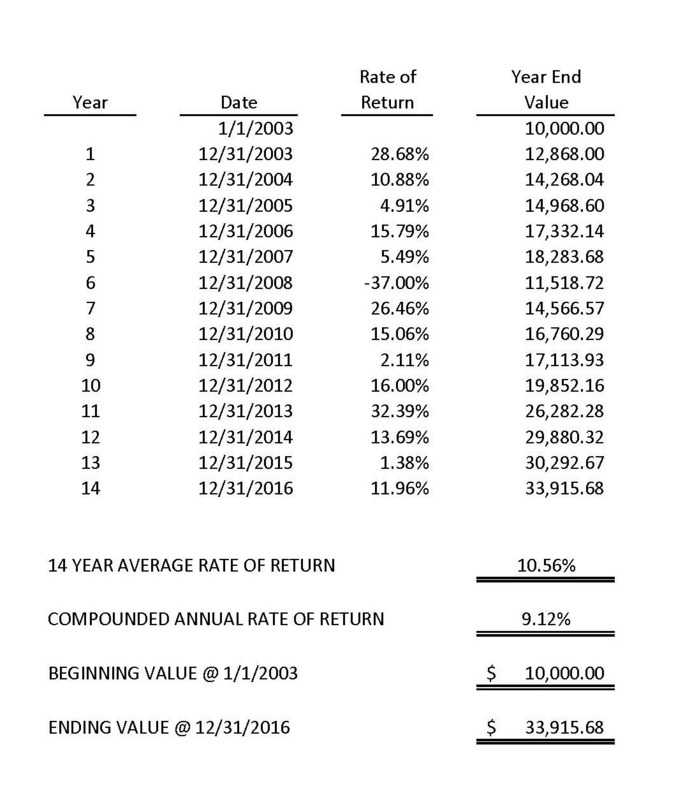 Including the end of 2016, 13 out of the previous 14 years (reflected in the chart below) had a positive rate of return. If I were to give any of you a 93% chance of winning in Las Vegas, you would most likely all take those odds, yet every day we run across people who have not invested their cash due to their fear of losing money. Next weekend, I will write a full report on 2016 as a whole as I have many things to talk about, including the unusual situation of growth not outperforming value. Also, I need to discuss the current valuation of the market, how the new President’s economics may affect the market as well as the rallies we saw after the presidential election. For the time being, I just wanted to get the good news out so that everyone could reflect on it over the next week before I write the full blog, along with my projections for 2017. In my blog dated January 13, 2016, which can still be found online, I made my predictions for the 2016 year. After going through a fairly extensive calculation of estimated values, I projected that the S&P 500 would be up 6.8% for 2016. And good news for us, it was up even higher. If you will refer to my quote below from that blog, you will see that while I projected 6.8%, I realized the market had the potential to do even more. For the time being, I just wanted to update you on the good news and let you know that I will be writing the full blog over the next week.